An karnero usa ka hayop nga aada ha orden Artiodactyla. An Ovis aries in uska species han Mammalia nga ginhulagway ni Linnaeus hadton 1758. 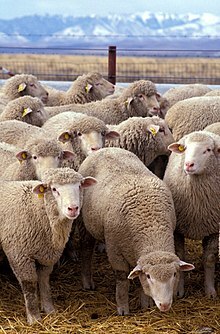 An Ovis aries in nahilalakip ha genus nga Ovis, ngan familia nga Bovidae. Ginklasipika han IUCN an species komo nadudultan. Waray hini subspecies nga nakalista. ↑ 1.0 1.1 "Ovis aries". IUCN Red List of Threatened Species. Version 2012.2. International Union for Conservation of Nature. 2008. Ginkuhà 24/10/2012. Weaver, Sue (2005). Sheep: small-scale sheep keeping for pleasure and profit. 3 Burroughs Irvine, CA 92618: Hobby Farm Press, an imprint of BowTie Press, a division of BowTie Inc.. ISBN 1-931993-49-1. Ini nga pakli kataposan nga ginliwat dida han 11:58, 30 Enero 2015.